Apparently, CC went to Seminara once I wasn't in Calabria. Seminara, a little village around 7 km from Palmi, is known to "insiders" for its pottery and ceramic art work. When you google the site, you do not find much. Maybe something about a battle in 1495 on wikipedia. If you search further, you might find something more interesting about Seminara's golden age during Renaissance here. Nowadays, Seminara is known in Calabria for it's interesting unusual and sometimes bizarre pottery. The fish above seems just harmless among some grotesque faces and babbuino masked objects. The scary faces originally were supposed to protect from evil. Similar like it is found in some Turkish and Greek art work. Due to trading around the Mediterranean sea the styles influenced each other. Therefor, you find egg. in Seminara and Sicily these ceramic heads, influenced by Arabic Moors. And I guess, that's why it's possible that Seminara craft men might have influenced Picasso (France) and Dali (Spain). Interesting are also the jars that are imitating by the look of sea urchins (ricci) and artichokes (carciofi). ﻿When we finally moved into our house, I realised that the lamp - the one with the big ugly fish from Seminara - would actually look not bad on the chest of drawers in the living room. The next day it was delivered... and - surprise - the fish was not too big anymore in our big living room! It looks even rather small! And with the sea under the windows, the fish suits very well. It even does not look ugly anymore. It is a piece of art! The not so big and not so ugly fish found its place into a house at the sea. Another more detailed source about ceramics from Seminara is cultura italia in italian language. From what I know, two of the most successful artists in Seminara are Paolo Candurso and Domenico Ditto. If you have more information about Seminara's pottery and its artist, please leave a comment. Happy Easter to everyone! e Buona Pasqua ! Today, Easter Monday, in Italian called pasquetta, little Easter, I am writing again from Bangkok. "Auguri per la festa delle donne !" It's international women's day, like every year on March 8. 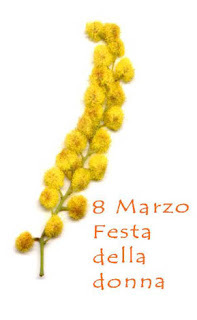 I wish you a happy day, to all of you women, ladies, girls, mothers, wifes, sisters - to donne, mamme e ragazze. It's international women day all over the world. Originally it celebrated the working women. In Italy it is popular and the flower that is given to the ladies, wifes and girlfriends to day is the yellow mimosa. If this day is celebrated in your country in a special way or there are some special customs, please share with us !